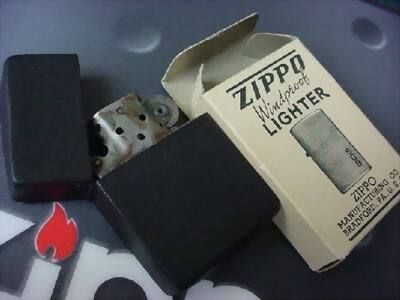 1942 black crackle with a later model box. 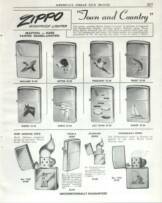 The 1942 has a 4 barrel hinge & unmarked insert, unlike the later 1943-45 black crackles which have the 3 barrel hinge & marked insert. 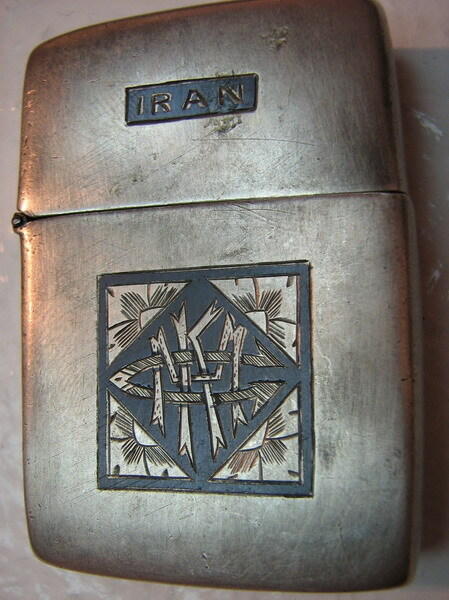 1942 Egypt - an interesting piece of history - this has the rare 1942 chrome over steel 4 barrel case with the error bottom stamp of Pat. 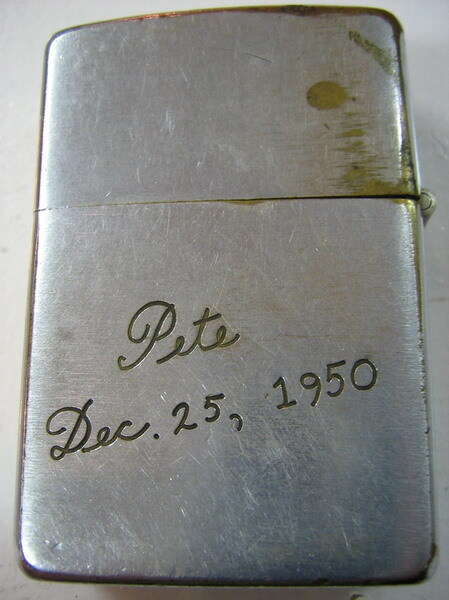 203695 instead of the correct Pat. 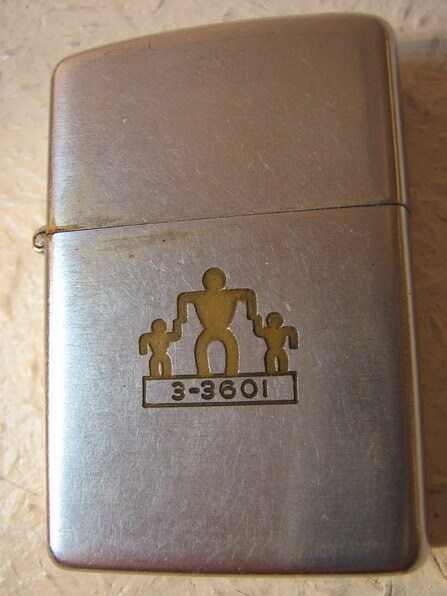 2032695. It's insert appears to have been replaced with a 1946-48 insert (??) 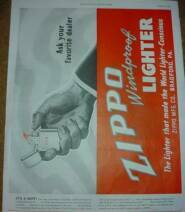 judging by the shape of the chimney & the cigarette-filter-like cotton end. 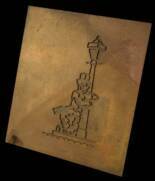 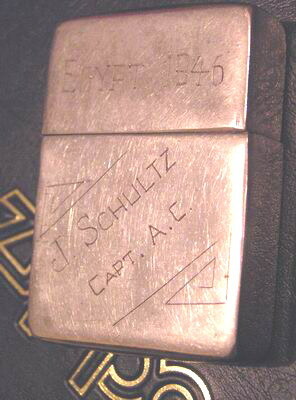 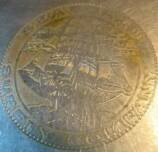 It has been professionally engraved "Egypt 1946, J. Schultz, Capt. 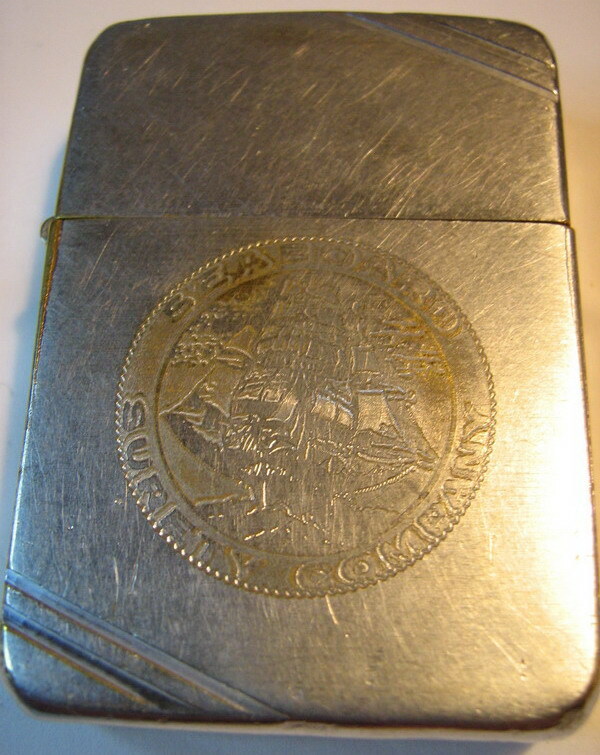 A. C." (U.S.Air Corps). 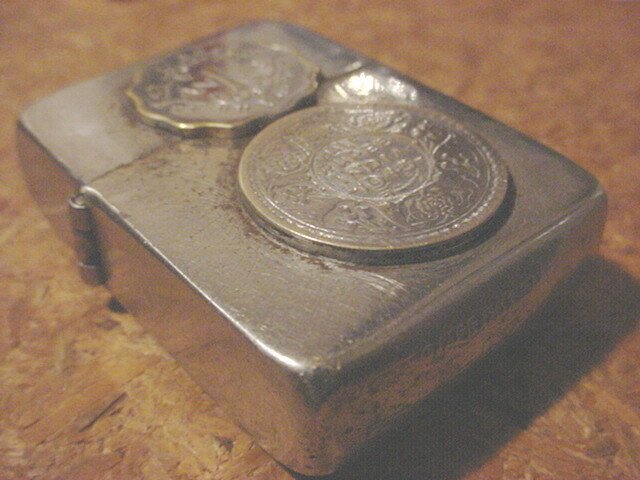 1943-45 India - 3 barrel hinge, featuring Indian coins of the period. 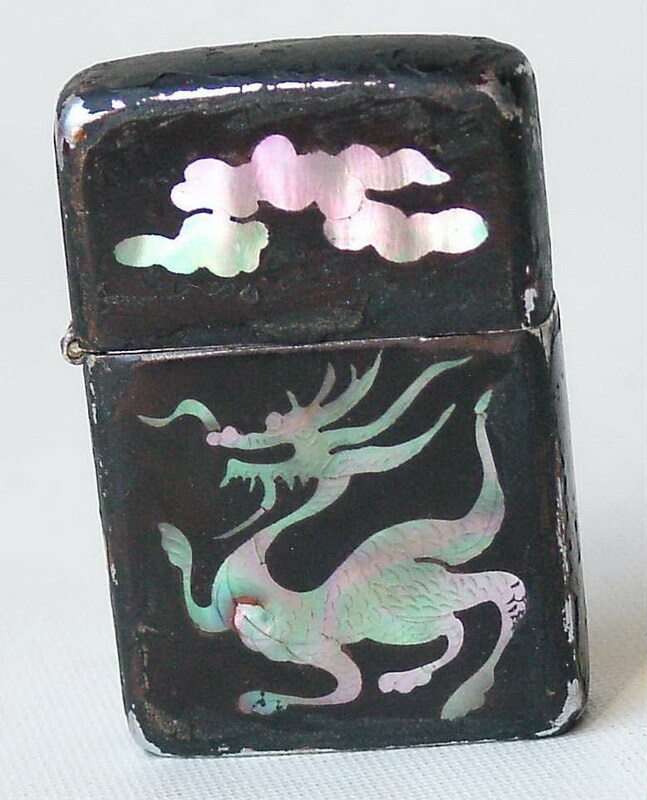 It was originally a black crackle which had the crackle removed by it's owner (as often happened back then) rather than being the rarer high polish steel version. 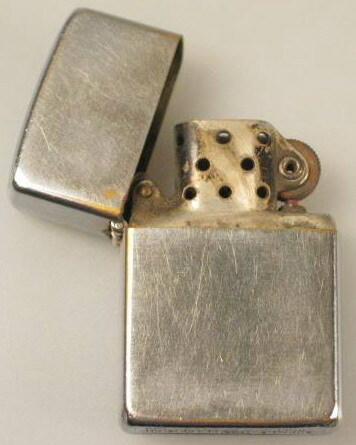 c. 1946 Town & Country Trout prototype with 3 barrel hinge. 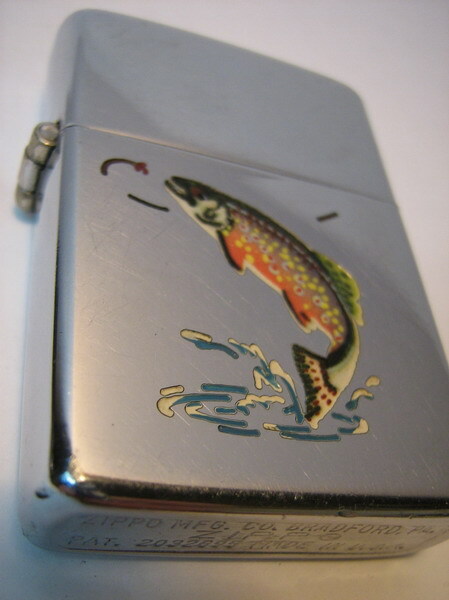 The first Trouts show the water as line drawn whereas the production models had the water filled in as a solid mass. 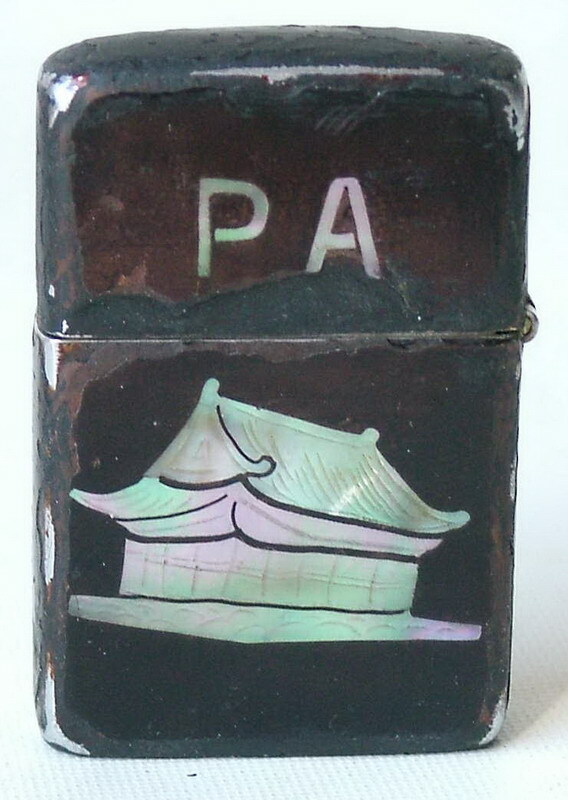 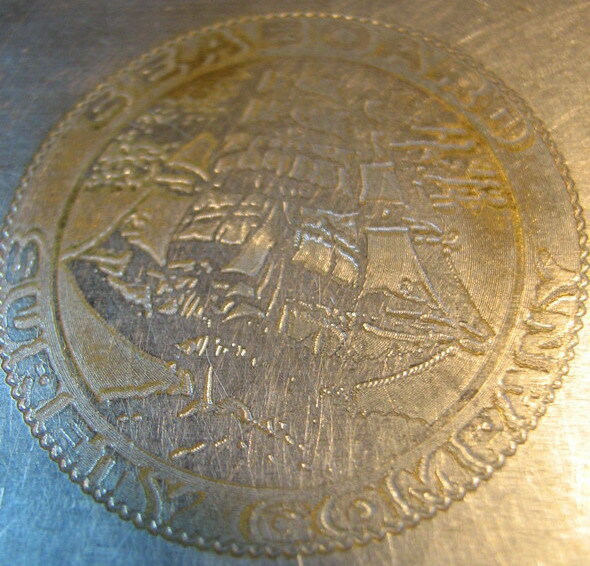 The Town & Country's were first deeply engraved & then hand filled/painted with an enamel paint & baked. 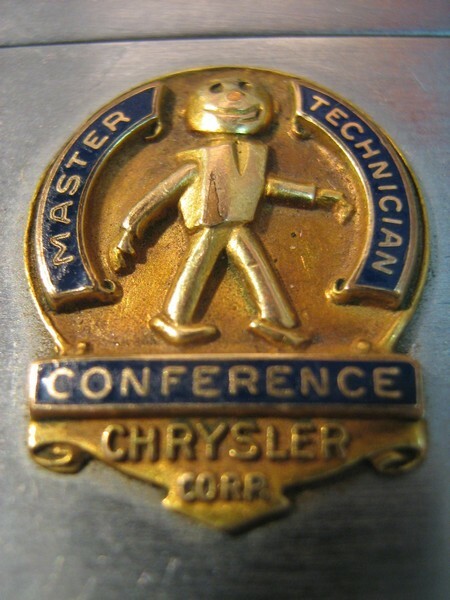 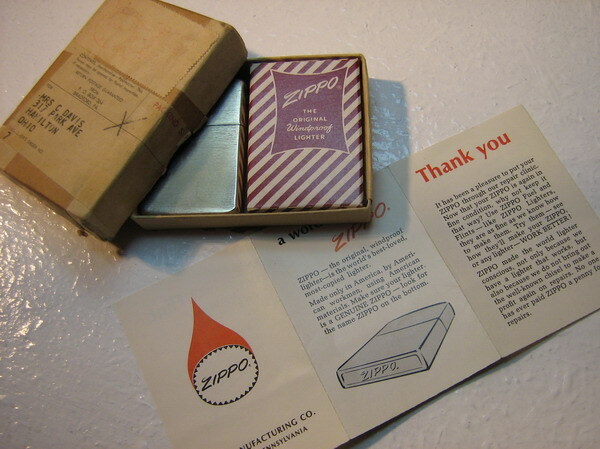 As the Zippos were put in pockets with keys & coins etc it is very difficult to find a T&C with all the paint intact. 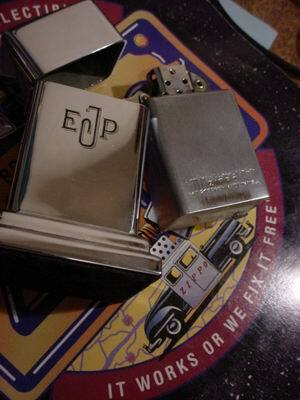 was replaced at same time. 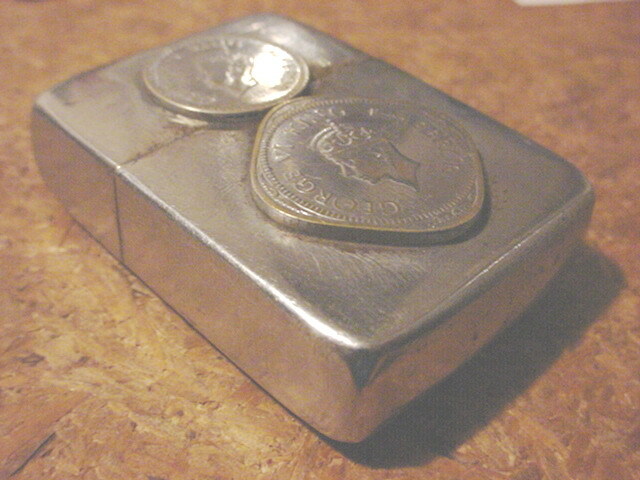 The case is missing most of the chrome allowing the yellowish tint of the nickel silver to show through. 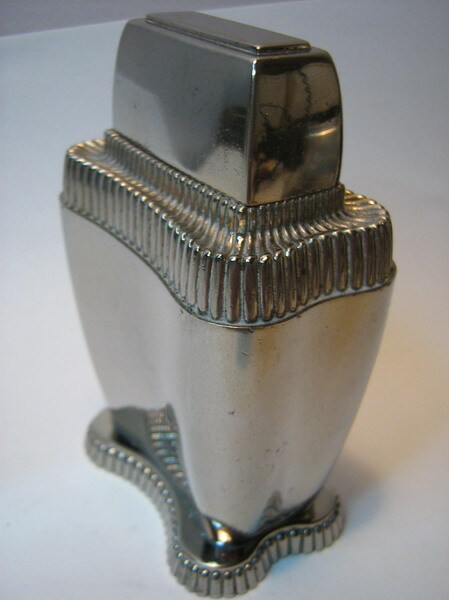 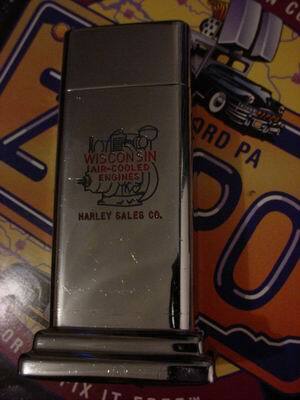 1946 tall case nickel silver with original horizontally grooved striker wheel. 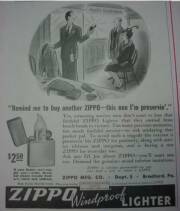 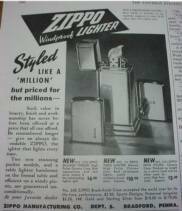 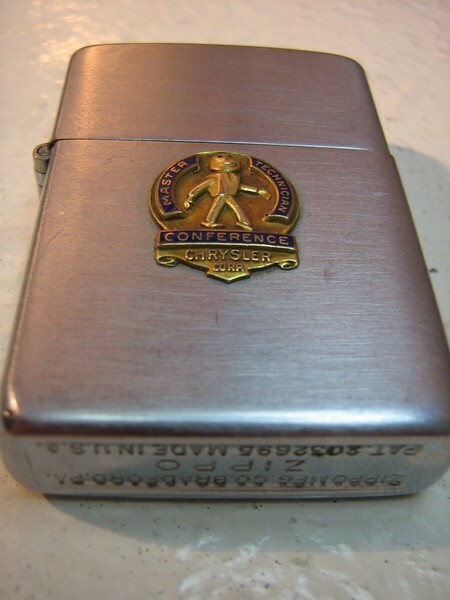 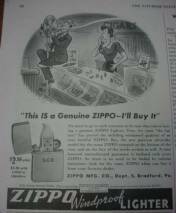 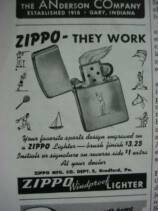 This had a 5 barrel hinge replacement by Zippo in 1962 & is in it's repair box (dated June 11, 1962) as it was sent out from Zippo. 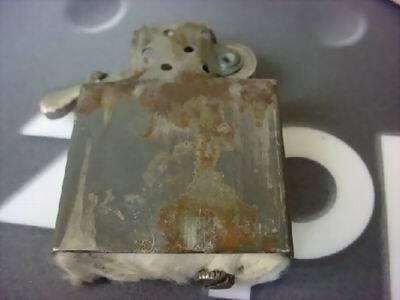 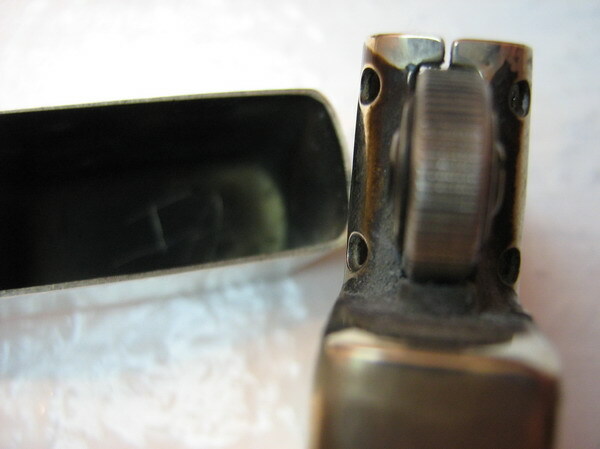 The 3rd photo shows a close up of hinge repair. 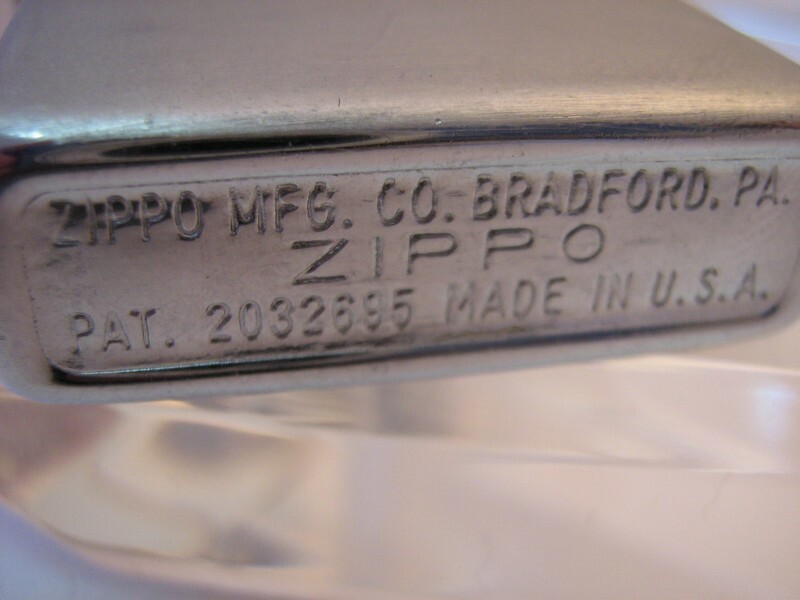 5th pic shows the horizontal grooved striker wheel & inside lid shows repairers mark scratched into underside of top of lid. 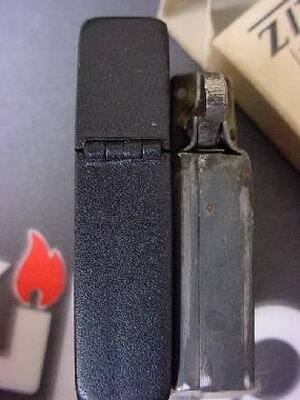 1947 3 barrel hinge with it's original insert & most of it's original paint. 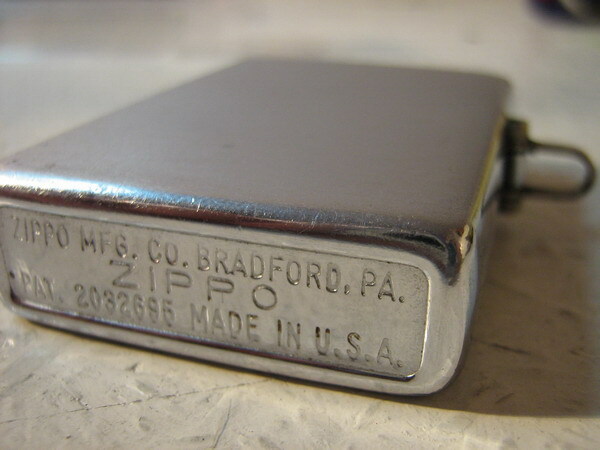 1949-54 Barcroft - the 3rd or "Short, full insert" model. 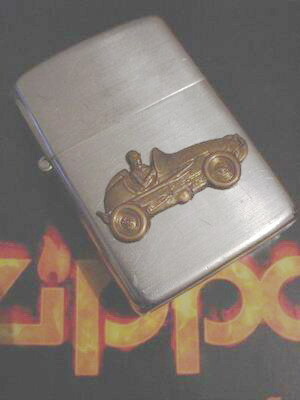 Late '40's Midget Racer - 3 barrel hinge with a nickel silver insert. 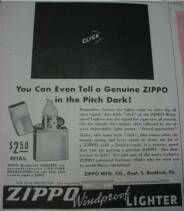 Unfortunately it's difficult to date it exactly although based on it's insert it's more than likely a '48-49 model as it has a felt pad end. 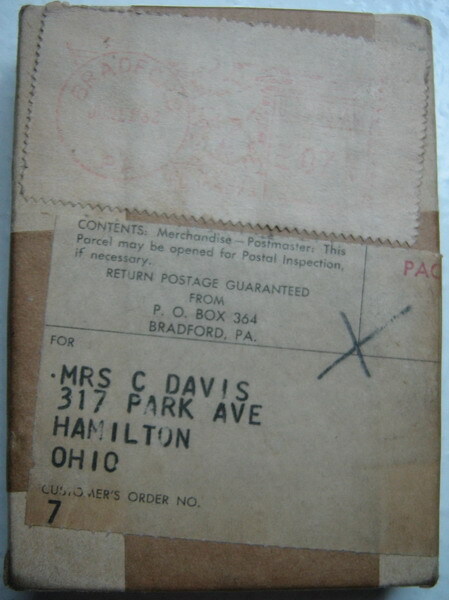 1949 Canada Release Patent Pending Niagara Falls logo bottom stamp. 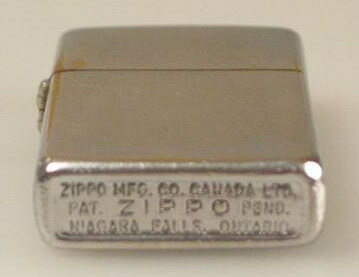 The Canada factory, in Niagara Falls, Ontario, was opened in 1949 & closed in 2002. 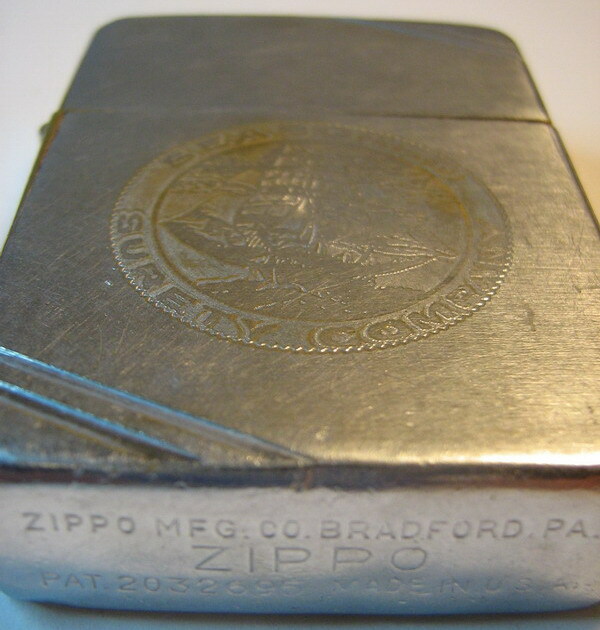 Because of it's low production numbers & the factory closure Canadian release Zippos have become highly sought after. 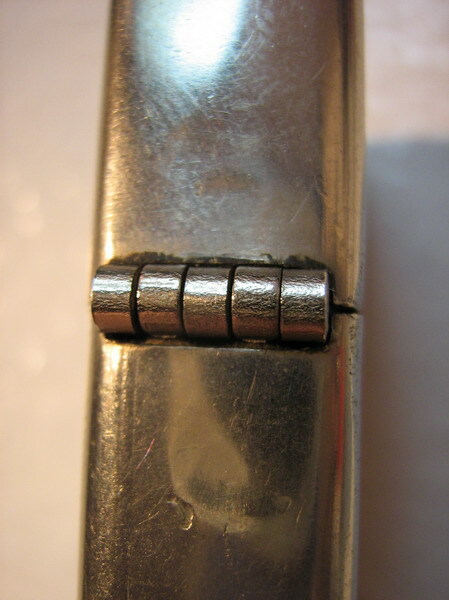 c. 1949 - 51 3 barrel hinge with nickel insert. 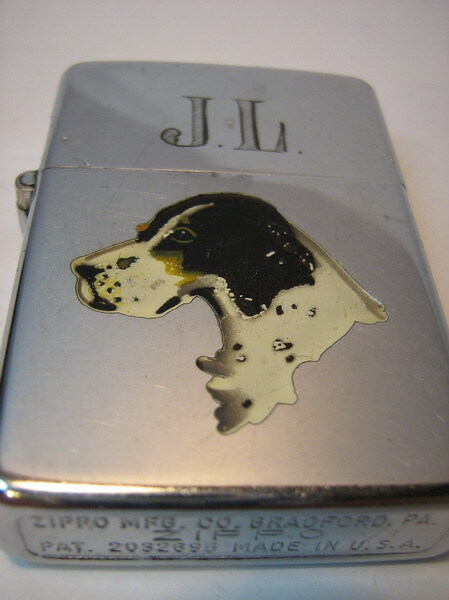 Originally this was a chrome over brass in terrible condition but it was lovingly restored, silver plated & repainted by a good friend, Jules, in the UK - thanks Jules!!!! 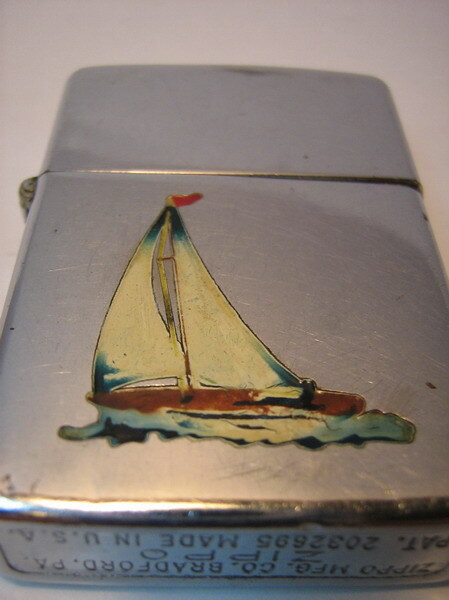 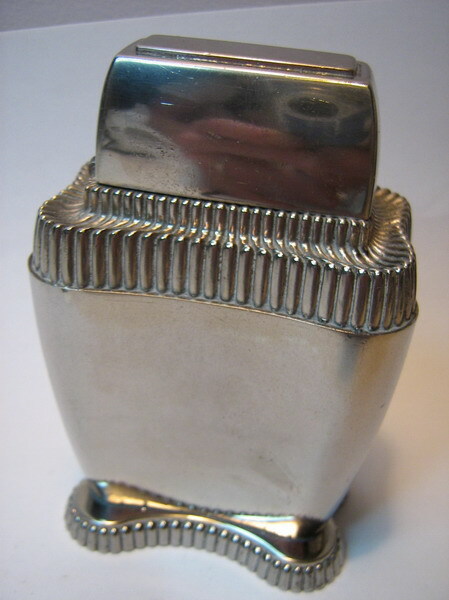 1949/50 Town & Country Sailboat, 5 barrel hinge, chrome plated nickel silver case. 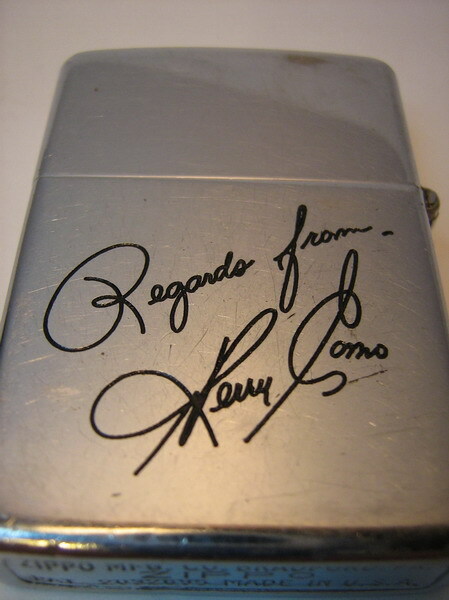 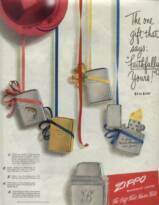 Signed by Perry Como on the back - he had them engraved with a personal message & gave them to colleagues & friends. 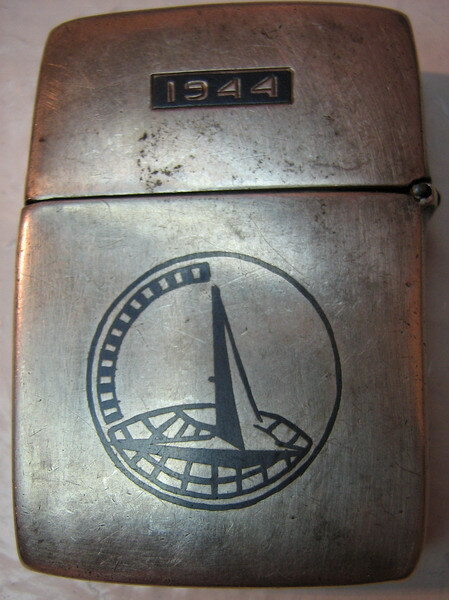 c. 1944 ?? 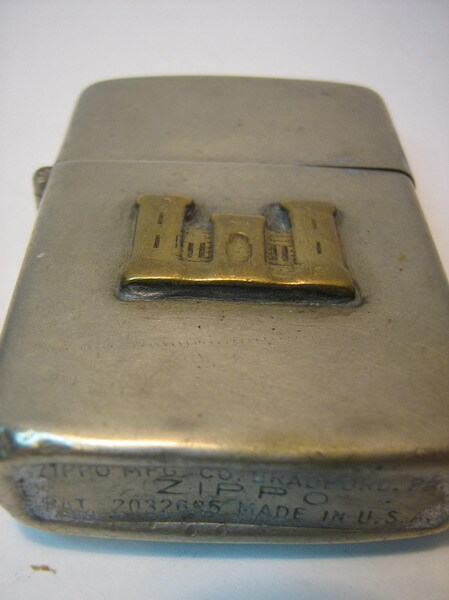 silver case with chisel engraved monogram probably made for Zippo insert (it has a cam stop for a Zippo style insert although it came with a much later Zippo insert which doesn't fit snugly). 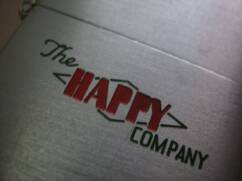 The logo on the back (?? 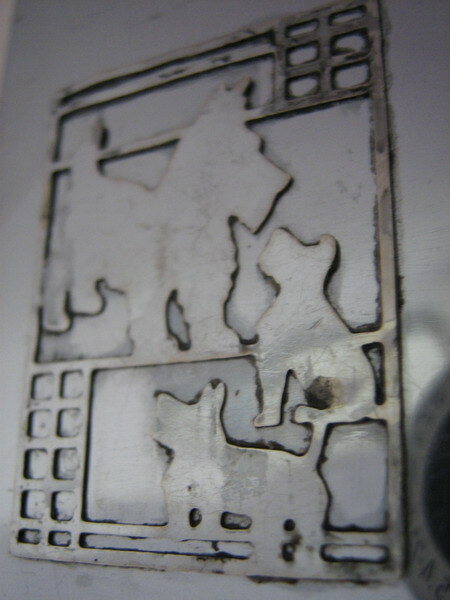 a building) is on the surface - help needed on the technique used to put it there. 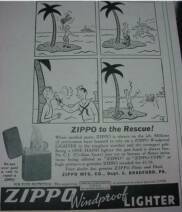 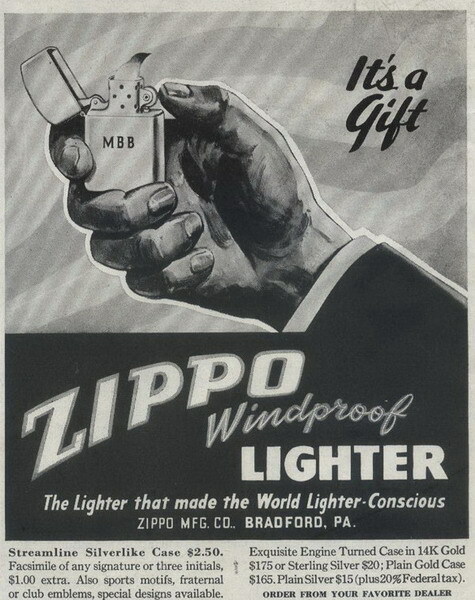 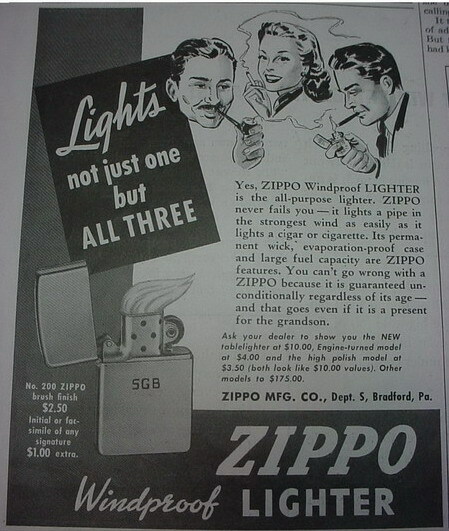 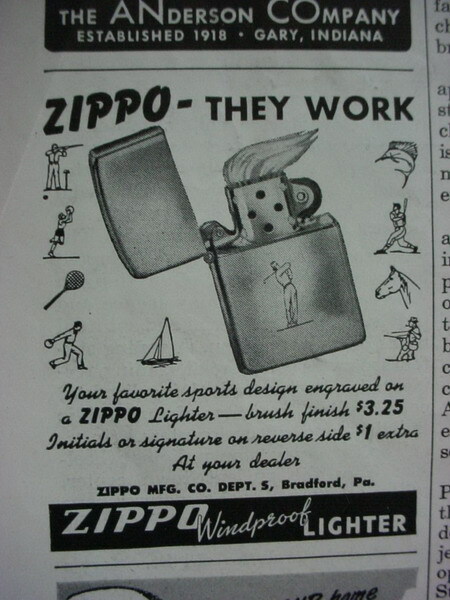 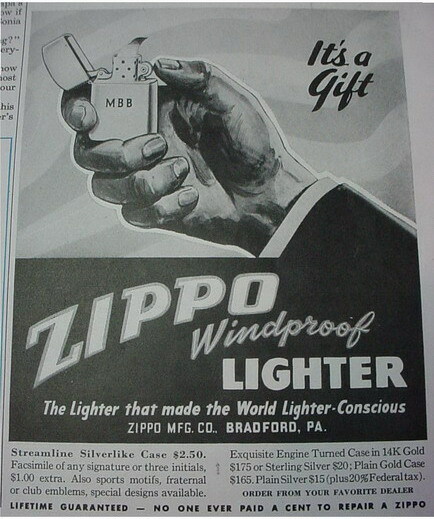 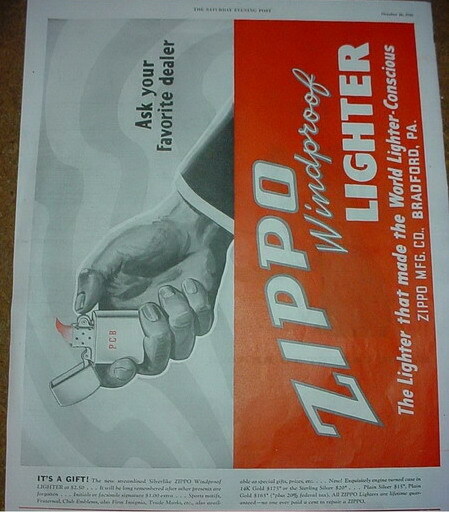 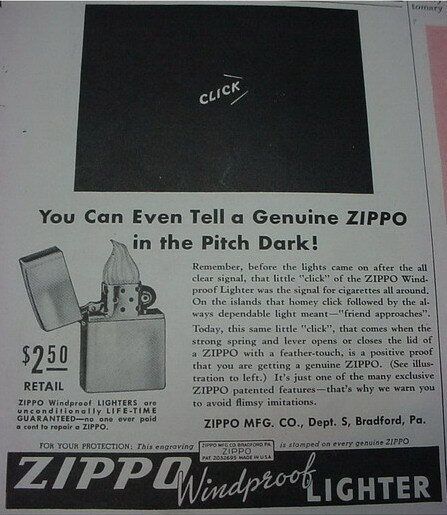 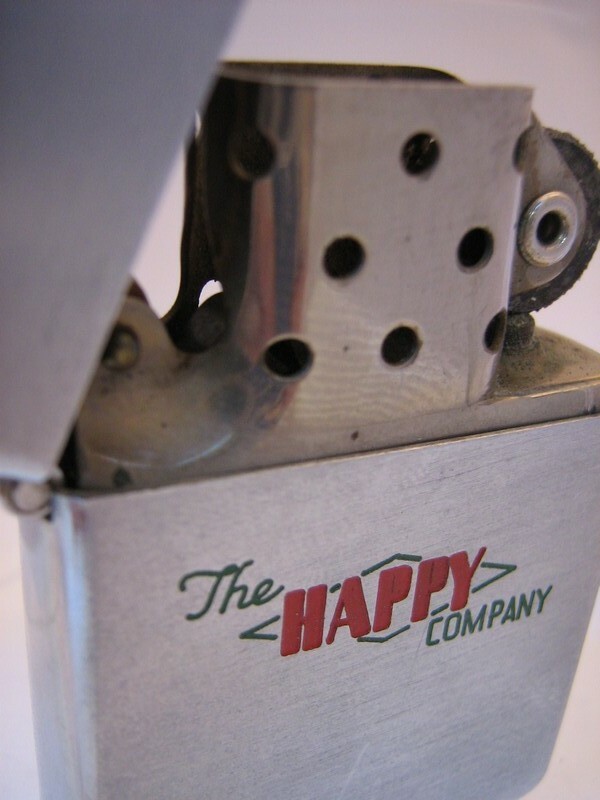 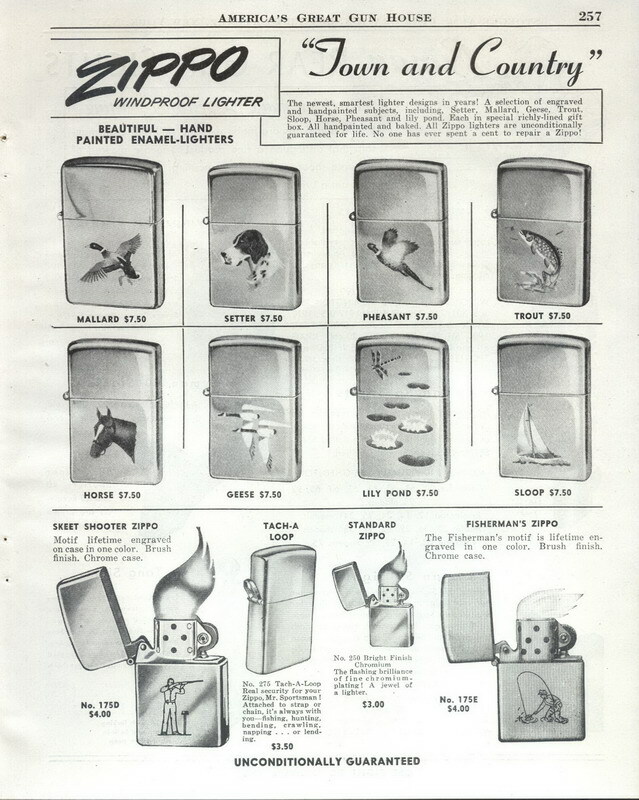 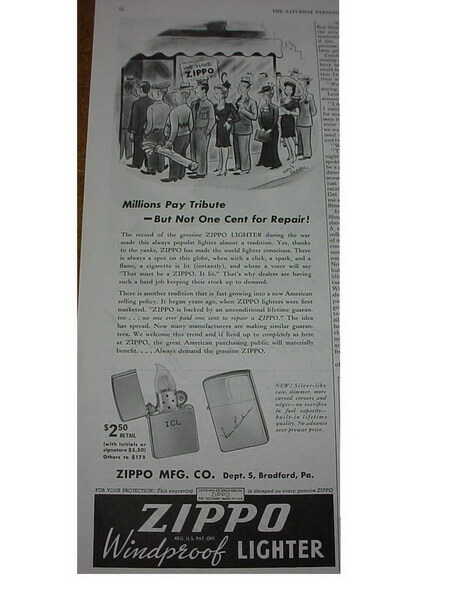 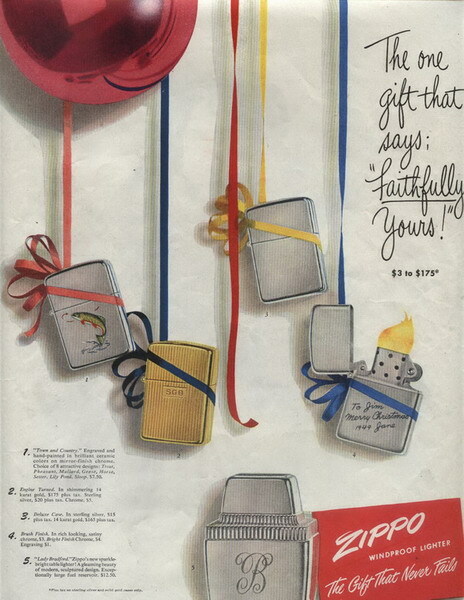 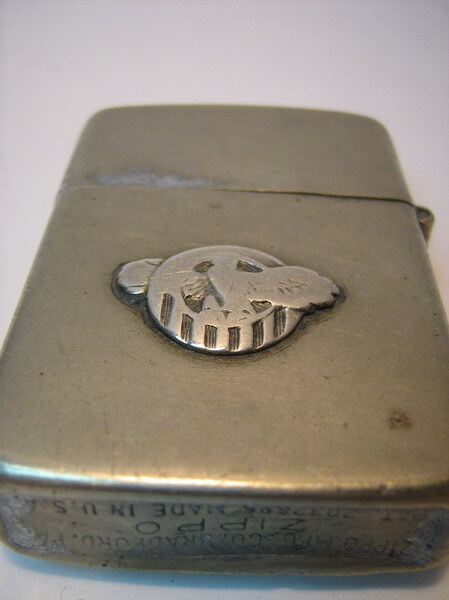 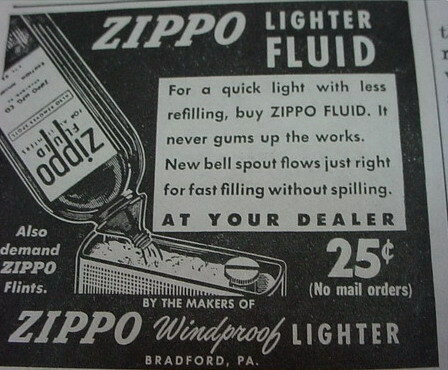 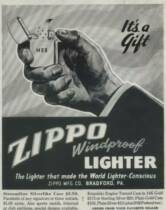 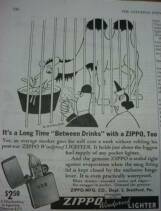 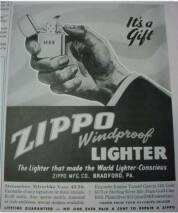 c. 1947 Zippo started to produce the Tach-a-loop (later known as lossproof) which had an elasticated cord attached to a loop mounted to the hinge. 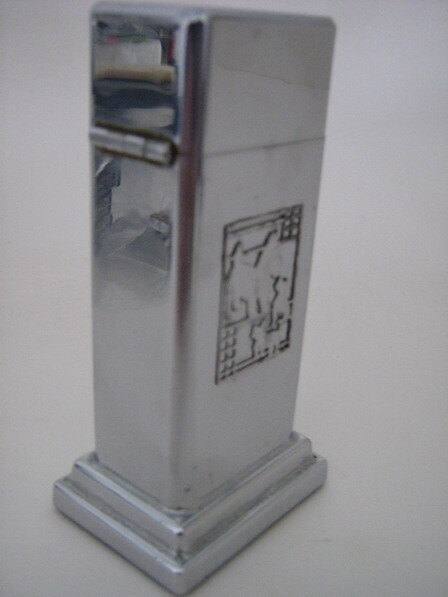 This,the first model, has the u-shaped loop with a 3 barrel hinge (a later version with the same u-shaped loop has a 5 barrel hinge). 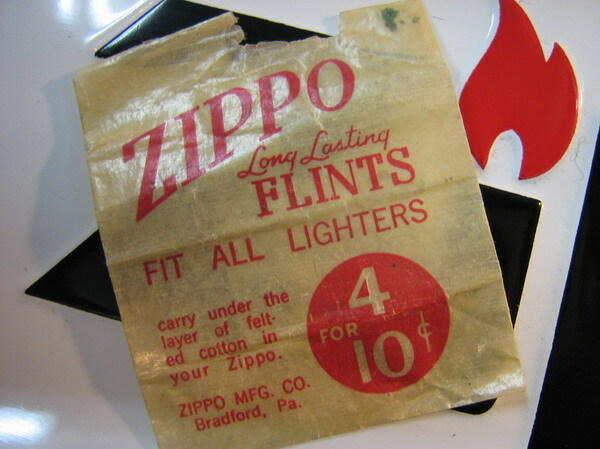 The second model had a long triangular loop & the 3rd a shorter triangular loop (still in production today).As the elastic cord was prone to breaking over time it's extremely difficult to find an early one with it's original elastic cord. 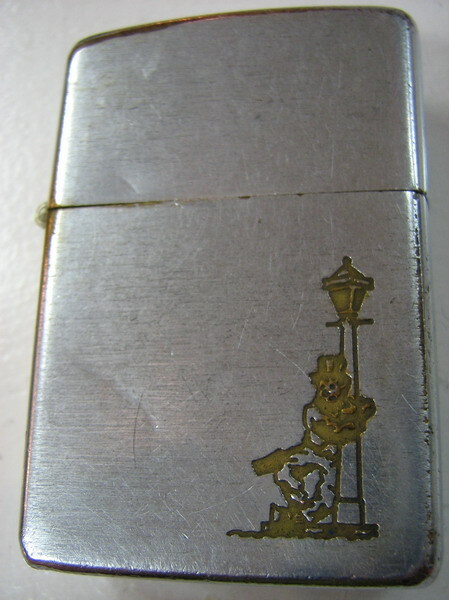 Scotty the Dog metallique Barcroft - unusual in that the metallique is not colour-filled & is a larger version than the metallique normally seen. 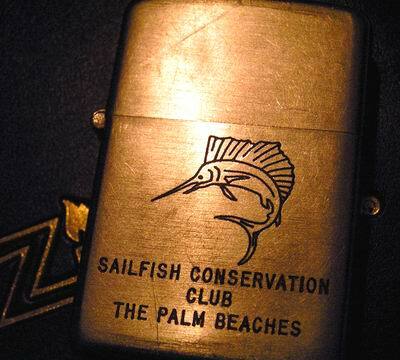 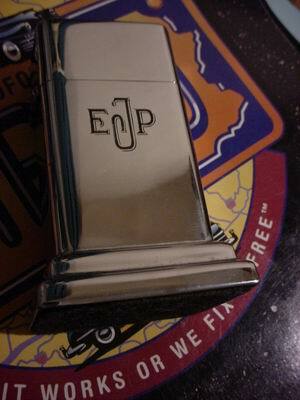 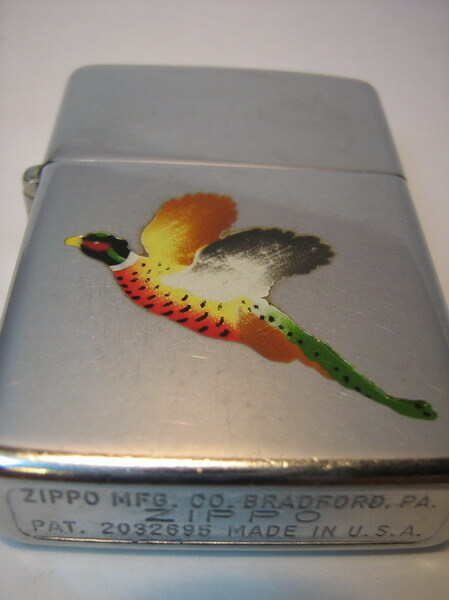 It is supposed to have come from an ex-Zippo salesman's estate. 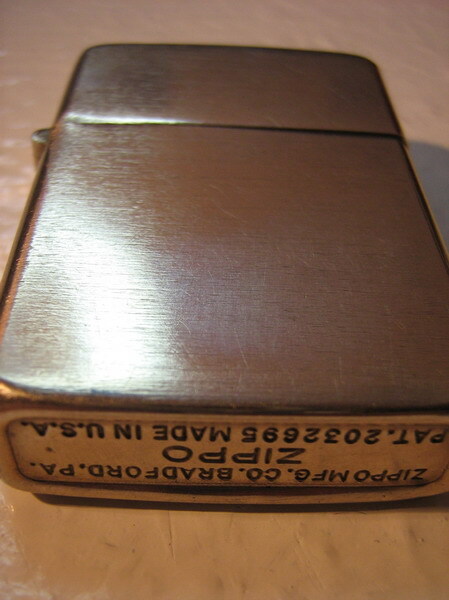 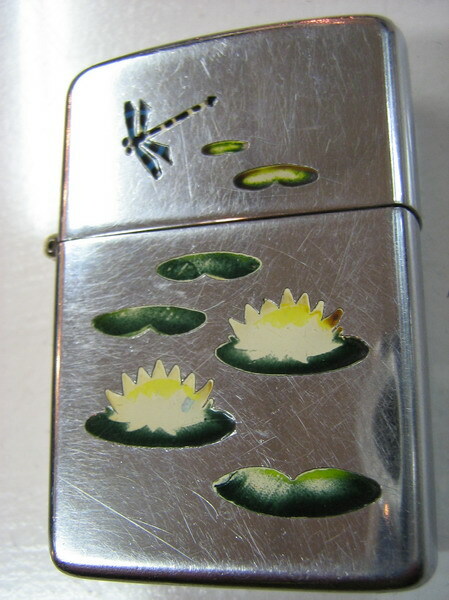 Interestingly at the 2008 OTLS convention someone arrived with a lot of old unattached metalliques from the company that made them for Zippo & amongst them was this exact oversized metallique.